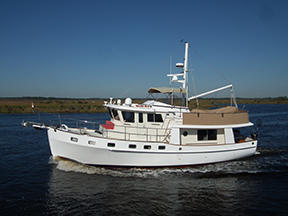 Noise reduction is especially important on trawlers as they are typically used for long range cruising. On long voyages you spend significant time on and below deck. Excessive noise can detract from your enjoyment and make sleeping underway difficult. Over the past 30 years, Soundown has built up extensive experience in reducing noise aboard trawlers. We’ve used that experience to develop this list of recommendations for dealing with the most common noise sources. While no two boats are the same, this list will get you on course toward a quieter vessel and more enjoyable time aboard. Each treatment description below includes recommended materials as well as the path it will treat (airborne and/or structure-borne) and the areas of the boat where it will be most effective. Problem: Engine noise transmits through the overhead and bulkheads of the engine room and into the vessel’s accommodation areas. Barrier composite insulation on the overhead and bulkheads. 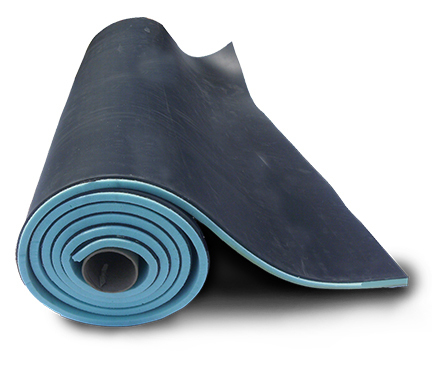 Barrier composites sandwich a layer of mass-loaded vinyl with acoustic foam. The foam absorbs noise while the mass-loaded layer reflects noise back into the engine room, protecting accommodation areas. Soundown’s IVF (insulated vinyl/foam) composite sheets are highly effective and are easy to install in new builds or during refit. 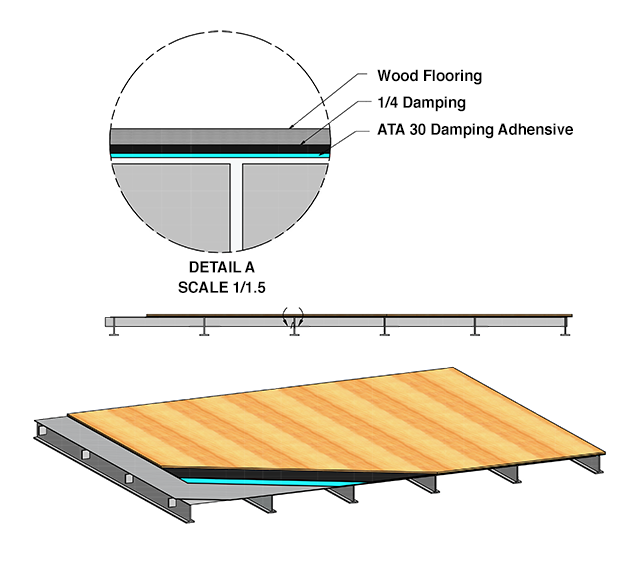 During a refit, thinner solutions might be easier to handle and position.For a new build, we recommend a 4-inch (total width) sandwich, with foam or fiberglass on each side of the barrier, if your build-in has the space. When you build in place, each layer is fastened as you go. 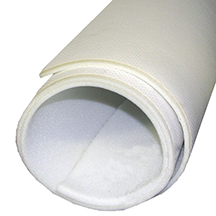 This lets you use larger sheet sizes and reduces the seam areas where leakage can occur. New construction – build in place with customized thicknesses as space permits. For hull sides or fuel tanks outboard of the engines we recommend Soundown’s IAF acoustic foams. IAF does not feature a barrier – the foam absorbs noise in the machinery space resulting in less noise in the accommodations. It’s also effective at reducing airborne noise that often escapes through the ventilation system to other parts of the boat. For a high level of clean finish and additional noise reduction, Soundown QuieTech perforated aluminum sheets can be installed over insulation. QuietClad damped aluminum. Where a hard finished interior surface is standard, the QuietClad damped aluminum sheets provide both a clean white finish and excellent noise blocking properties, especially when used in conjunction with QuietStrips and acoustic fill. Problem: The most dominant noise on deck is typically from the exhaust. Even vessels equipped with basic mufflers experience significant levels of exhaust noise on deck. The rumble of exhaust is typically low frequency, which is not only bothersome but also causes fatigue. This is often magnified in vessels with hardtops, because the height from the deck to the overhead is typically equivalent to ¼ wavelengths of the exhaust tones. At ¼ wavelength a resonance will develop between the deck and overhead, reverberating and amplifying the noise. If a vessel has significant camber in the hardtop, you can often walk in and out of these “hot spots” where noise levels are the highest. Soundown’s Waterdrop silencers are custom built for each installation and tuned to the specific frequency of your engine. With noise reduction as high as 25dBA, wind and water noise become the dominant sounds at cruising speed. At slower speeds, deck areas become more comfortable. Problem: The relatively lightweight construction of trawlers compared to the high horsepower of their engines means significant vibration is created while the engine does its job. Isolation Mounts for the engine. These decouple the engine from the hull, isolating a significant amount of vibration.Typical drivelines feature close coupled engine and gear which require a mount that can handle both the weight of the engine and the force of the propeller thrust. The Rubber Design TT mounts (Thrust & Torque) are designed specifically for such applications. The TT’s unique design uses a series of rubber plates in shear, to provide isolation when positively or negatively loaded. By combining size and rubber stiffness options, Soundown can craft a unique mount for your vessel that avoids excessive engine movement while providing ideal vibrational isolation. For vessels where noise reduction is a high priority we suggest removing the thrust force from the engine by installing a thrust bearing such as those provided by Aquadrive (available from Soundown). By installing a thrust bearing with a highly flexible connection to the engine, such as a CV Joint, the engine mounting can be set up for higher deflections. The higher the mounting deflection, the better the noise reduction. Rubber design flexible shaft couplings are another option to consider. Energy created by the meshing of gear teeth transmits down the propeller shaft, resulting in “gear whine.” This noise is high frequency and does not add to the dBA level (measure of overall loudness), but the high frequency tone of this noise is extremely irritating. Reduction of gear noise is particularly important aboard vessels with aft cabins. Cabins located directly over the shaft are prone to very high levels of gear whine that can make them particularly unpleasant while underway. 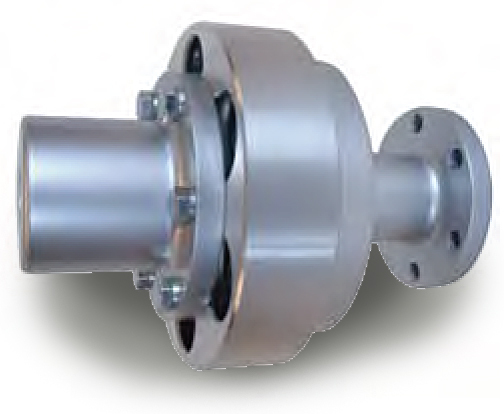 Shaft couplings provide a buffer for this energy as it travels down the shaft, reducing the painful noise. Problem: Energy from the vessel’s engines, reduction gears, propellers and hydrodynamics will excite the structure and radiate into the accommodation areas. While this is not typically a vibration that you can feel, it does cause unwanted noise. Soundown premium carpet underlayment, an alternative to standard carpet padding, provides plush foam padding that decouples a denser mass layer from the deck. The sole, carpet underlayment and carpet work together to create layers of sound absorption and blocking. 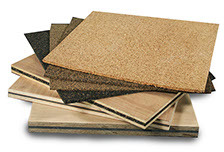 Carpet Underlayment comes in a variety of thicknesses to accommodate your headroom requirements. While thickness constraints mean carpet underlayment is not a replacement for good engine room insulation, it can be a good upgrade to boats with well insulated engine rooms or a quick, easy first step for boats where engine room insulation isn’t enough.The ease of installation makes this treatment an easy upgrade for any vessel. 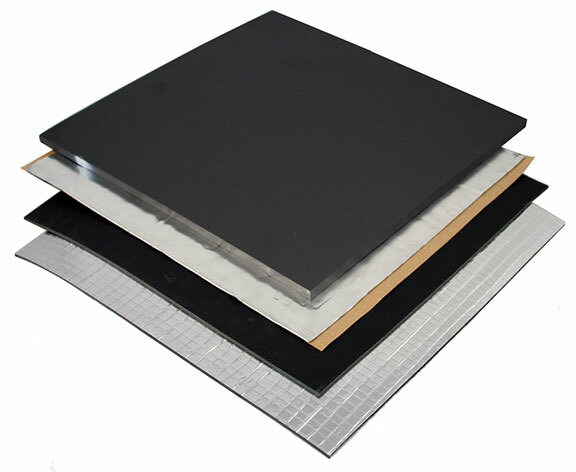 For flooring with hard finishes such as wood or vinyl a layer of Soundown DT Series damping sheets can be installed under the finish. This is especially effective with wood or vinyl flooring, where an added ¼ inch of damping material on top of the subfloor can absorb energy before it radiates through the deck. This installation would then have quarter-inch plywood flooring on top of the subfloor. This combination works well in most trawlers, strengthening noise reduction while helping to keep the flooring fare and even. Floating soles. For vessels seeking the highest level of noise reduction to produce extremely quiet interiors, floating the salon and/or lower deck soles is a must. 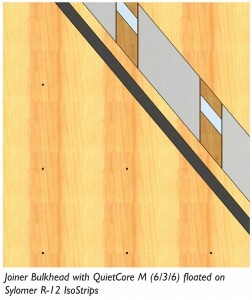 In the detail below you can see how QuietStrips are used to isolate the QuietCore sole from the vessel’s structure. This effectively isolates the mass of the sole in the same manner as the barrier in the engine room insulation. The advantage of treating the interior is that there are no flanking paths through the structure. Problem: Depending on the proximity of cabins to the engines, good engine room insulation may not be enough. The culprit in this case is typically the high level of structure-borne vibration in the bulkhead which radiates into the cabin. This treatment also reduces noise transmitted from cabin to cabin. In vessels where cabins are separated by only a single bulkhead, talking, media, or just moving around can be heard by other passengers. By floating the interior panels, we can break the path of that vibrational energy, and increase transmission loss which reduces interior noise and improves privacy. The detail below shows a floated bulkhead. Problem: Machinery noise that is transmitted into the accommodation areas of the boat will reverberate off hard surfaces such as bulkheads and overheads. This amplifies the noise in the cabin and can make communication difficult. Liners produce an effect that’s like comparing an empty room to one with a carpet, curtains, and other soft finishes that absorb reverb. Problem: As the propeller creates thrust some of that energy is transmitted through the water and into the hull causing vibration and structure-borne noise. This effect becomes more pronounced as the propeller tip gets closer to the hull. As a rule, if the clearance between the propeller and the hull is smaller than 15% of the propeller’s diameter, you will experience a significant noise issue. 20% clearance is preferable. Damping tiles. These tiles are moderately malleable and can shaped to follow the bilge. 3/8” can work, but 5/8” will be even more effective. Ideally, you want to take the diameter of the propeller, double it, and treat a square patch that size right above the propeller (so, if you have a 24-inch propeller, cover a 48-inch by 48-inch square with damping tiles).